The village website constantly turns up surprises as people from all over the world contact us, but Ken Boyd’s recent message from Vancouver in Canada was more unusual than most. He asked if I knew that a traveller family in Datchet had been the subject of paintings by the artist Sir Alfred Munnings – which led me to write this article for the parish magazine, The Link. 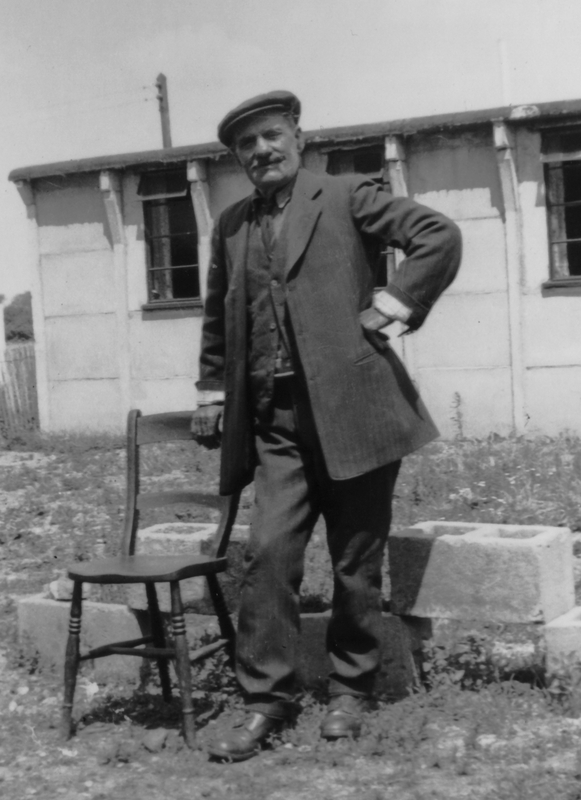 Ken’s mother Kathleen Wingfield was a traveller (or gypsy) who lived in Horton and then Datchet until 1947 and still speaks of making wooden flowers, baskets, selling fire wood door to door, and making coloured candles from wax and childrens’ crayons. 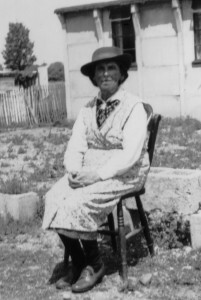 In 1947 she left Datchet for Canada after marrying Walter Boyd, a Canadian soldier. She had met him at the Rising Sun pub when he was stationed on the old Guards’ polo ground during the war. (The polo ground, north of Horton Road, has been obliterated by the Queen Mother Reservoir.) In wartime, Kathleen and her sister May had worked in ‘making ships’ compasses’, which must have been at the ACO in Ditton Park, while her younger brother Len Wingfield had manned an anti-aircraft gun at the polo ground base. May also married a Canadian and lives in Vancouver. Kathleen and her parents were photographed at the polo ground on the day she left Datchet, by which time they were living in the concrete barrack huts which had been built for troops during the war. Below is Fanny Wingfield, Kathleen’s mother, and her father, Alfred Gregory. Altogether, Alfred and Fanny had six daughters (May, Kathleen, Ivy, Helen, Violet and Mary) and four sons (Alfie, Ruben, Len and Bill), all of them Ken’s aunts and uncles. Travellers continued to use this land until the reservoir was constructed, and then moved elsewhere until the present Mill Place site was provided for them. 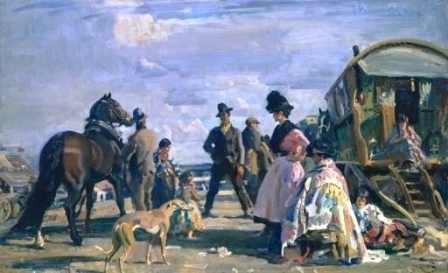 This family makes a dramatic appearance in the gypsy paintings of Sir Alfred Munnings (1878-1959). Perhaps the greatest painter of horses since Stubbs, Munnings’ work is still fashionable and commands huge prices at auctions, especially in America. Munnings was a master of the sporting picture; it is said that he could paint the king and queen at the races one week, the travelling people the next. From the early twentieth century Munnings had been fascinated by the gypsy hop-pickers in Hampshire. He wrote: More glamour and excitement were packed into those six weeks than a painter could well contend with. I still have a vision of brown faces, black hair, earrings, black hats and black skirts; of lithe figures of women and children, of men with lurcher dogs and horses of all kinds… Never in my life have I been so filled with a desire to work as I was then. A great many of Munnings’ works were horse racing scenes and the one above was painted specifically for the Royal Academy exhibition of 1954, where Munnings called it Arriving at Epsom: a scene from the past. It is clear from this title and the nature of the work that Munnings intended it to be the culmination of all his gypsy pictures. 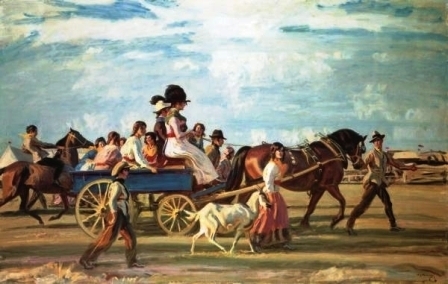 By returning to subjects from earlier in his career, Munnings was perhaps acknowledging his debt to the gypsies as well as presenting to a new audience an insight into a way of life and traditions that, he feared, were fast disappearing. ‘Moocher’ (a horse dealer himself) is shown here leading the mare with Ocean and Comfort in their ostrich-feather hats on the wagon. But Datchet’s travellers didn’t only appear in paintings. In 1937 Henry Fonda made and starred in a movie called Wings of the Morning about an American who falls in love with a gypsy woman. Gypsies were hired as extras and Uncle Moocher was a horse wrangler for the film; he appears in the movie holding horses with his wife Aunt Sarah walking between the waggons resplendent in her feather hat. While Wings of the Morning (the race horse’s name) was not a great film, it has a place in film history as the first Technicolor movie shot in the British Isles.